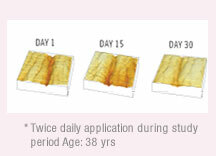 Clinical results have shown that after a single treatment skin appears smoother and more firm & radiant. Within 3 weeks of use, up to 50% reduction in fine lines & wrinkles was found, with over 80% of users seeing younger looking skin after use. The non-comedogenic products are mineral oil & perfume free & contain no colorants, no animal extracts & minimal preservatives. What is Bio-Lift Skin Care? It is Swissmed’s skin care line featuring the revolutionary “Anti wrinkle Hexapeptide” a combination of 6 natural amino acids that reduce wrinkle depth and prevent skin aging. Antiwrinkle Hexapeptide works by slowing down the excessive secretion of certain chemicals in our skin responsible for overstimulation of facial muscles. The hexapeptide attenuates this excessive stimulus, relaxing facial muscle tension. Anti wrinkle Hexapeptide works by slowing down the release of enzymes in the skin responsible for over stimulation of facial muscles. The hexapeptide has an immediate and accumulative long lasting dermo smoothing effect thereby effectively reducing the appearance and depth of wrinkles caused by repeated facial movements. Swissmed Bio-Lift skin care formulations improve the tone, elasticity and moisture of the skin with Marine collagen, Hyaluronic Acid plus a blend of natural ingredients and anti oxidants such as Vitamin C & E.